We are proud to announce the big news! 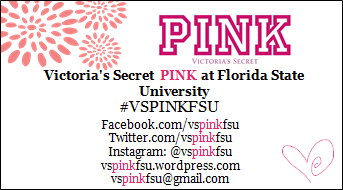 Our Facebook page: Facebook.com/vspinkfsu or Victoria’s Secret PINK at Florida State University just hit 3000 likes! Thank you to everyone who follows us on all social media outlets! We cannot wait to share with you all of the fun and exciting events we have planned for this fall!